In 1995, Harold Swash, known world-wide as Europe's premier putting coach, developed an innovative theory that would eventually result in the C-Groove putter which conforms to the United States Golf Association (USGA). While touring with golf pros, Swash learned that with a perfect stroke, the best putters started the golf ball rolling almost as soon as they struck it, while at other not-so-perfect times, the ball actually started by skidding for as much as 24 inches before the actual roll began. From this observation, Swash's belief became that "the key to more accurate putting is to achieve rolling motion immediately upon striking the ball." Thus, he began his quest to develop a putter that would allow more players to putt like a pro when they make a perfect stroke. An inventor/engineer, Swash used his experience to analyze what materials and designs would work best, as well as factoring in expert advice of his many students. Ultimately, Swash concluded that the concentric grooves etched into the metal face of a putter at 20-degree angles would create more "dwell time" for a golf ball. "Dwell time" is when the grooves struck the golf ball, that ball would be held a millisecond longer onto the face of a putter than a smooth-faced putter would. Furthermore, that additional "dwell time" would result in immediate and pure forward roll of the ball. With this roll, the ball has a better chance of staying on line to the hole. The summary of the findings is: "The C-Groove Putters Deliver Less Skid, Better Roll, and Fewer Putts." This is a summary of the information I received in the Press Kit with my putter a few weeks ago. As opportunity would present itself, I had a few courses to golf, so I took the new putter with me. However, after a few holes, I noticed that my accuracy increased. But what I liked about it most is that my accuracy from a distance was much improved. Normally, with lots of green in between you and the cup, your putt is heavy and tends to "jump" which doesn't always help the ball go the direction you'd pointed, no matter your stroke. When I used the new C-Groove, my putts stayed straighter even with the longer putts across the green. Has it decreased my handicap? I'd say yes, by at least three or four. The C-Groove Putters are available through PRO GEAR locally in Denver, or you may contact C-Groove directly at 1-800-845-4327. Their web site is www.bestputter.com. Prices for putters range from $119.95 to $139.95. 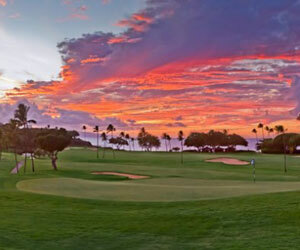 Enjoy four rounds of golf at either of Ka’anapali’s championship courses and a beautiful Ocean View room with a five (5) or more night stay at the Royal Lahaina Resort.